Help your bridesmaids look their best with this body type silhouette guide. Definition: Shoulders and hips which are roughly the same size, with not much definition around the waist. How to dress her: Look for a dress with a defined waist. Think an A-line, empire or mermaid silhouette, or simply a relaxed dress with a nipped-in waist. Definition: A ribcage and waist that are wider than hips and shoulders. How to dress her: Empire cut and wrap dresses will be her most flattering. Definition: A combo of slender shoulders, with wider hips and thighs. How to dress her: The universally flattering silhouette: the A-line. Definition: Her shoulders and hips are pretty much the same size as each other, but her waist is narrow and therefore very defined. How to dress her: Look for body-hugging dresses – such as a mermaid silhouette styles that feature V or sweetheart necklines. Her body shape: Inverted triangle. Definition: If the top portion of her body is larger than the bottom part, she likely has an inverted triangle-shaped body. An easy way to tell is if her shirt size is larger than her pant size. How to dress her: Choose a dress with an A-line skirt, and show off her shoulders with a sleek sleeveless dress or a sweetheart neckline. 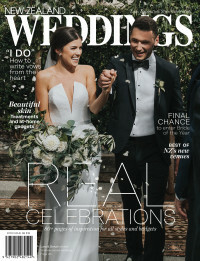 For more information about bridesmaid style, grab the latest issue of New Zealand Weddings magazine.